In this week’s History of Magic, we discuss the life of renowned magician Cardini, who in 1958 was proclaimed by the New England Magic Society as “the greatest exponent of pure sleight of hand the world has even known.” Cardini was born Richard Valentine Thomas on 24th November 1895, in the small mining district of Mumbles in Wales. As a youngster, Cardini was influenced by people like Chung Ling Soo, Nate Leipzeig, and the Great LaFayette. When he was a young man, he joined the British Army in WW1, where he fought in the trenches until he was wounded. He practiced his sleight of hand in the freezing trenches wearing gloves that were to later become an integral part of his act, and he continued to practice his sleight of hand diligently while recuperating at the hospital. He began his performing career in vaudeville in England but travelled to Australia and Canada. He crossed into America through British Columbia where he became an instant success. American magicians stated that they had never seen such an act as Cardini performed. Cardini possessed the uncanny ability of supreme dexterity. His masterful skill enabled him to flawlessly manipulate many objects, including playing cards, billiard balls, thimbles, and cigarettes. What was even more amazing was that he performed his magic routines while wearing white gloves. He appeared dressed as the supreme, elegant gentleman, complete with tails, top hat, a cape, and a monocle that became his signature feature. His sleight of hand manipulation was perfection, all presented as a sort of silent skit to music. He appeared as a slightly inebriated gent who seemed to be unable to understand how things were happening. His mannerisms blended so well with his sleight of hand. While performing in Chicago, he met and married who would be his lifelong partner, Swan Walker, who assisted him dressed as a page. Cardini performed in such venues as the Radio City Music Hall, the Palace, the Copacabana night club, the London Palladium, and many top-class night clubs and theatres. He performed eight times at the Whitehouse, four times alone for President Franklin Roosevelt, and in 1938 gave a command performance for Britain’s King George V and Queen Mary who were both completely captivated. 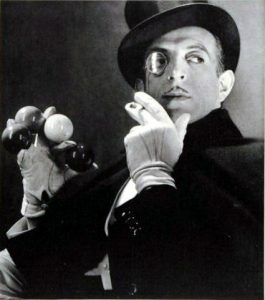 Cardini’s performance was different from all the other magicians and illusionists of the era so he became much in demand. Throughout his career, he achieved great fame and many accolades. He became president of the Society of American Magicians three times and in 1945 was made President of the Magicians Guild after the death of Theodore Hardeen. In 1957 at age 62, he appeared on one of the few magic television shows of the time entitled The Festival of Magic. 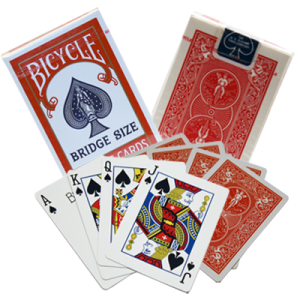 In 1960, he was awarded the prestigious Silver Wand Award from the London Magic Circle. Ten years later, he was awarded the Master Magician Award from the Association of Magical Arts at the Hollywood Magic Castle. The award was presented by former movie actor Tony Curtis, who himself was an amateur who performed magic for a hobby. Cardini’s nephew Randy Pitchford, a professional magician, funded a museum exhibit in Cardini’s honour at the Magic Castle where some of his uncle’s artefacts and memorabilia can be viewed. 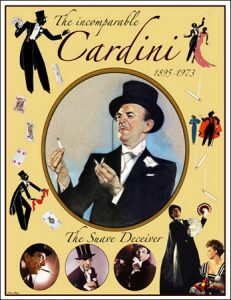 In 1999, after Cardini had passed away, he was named by one of Magic’s Magazine as the top magician of the century. Cardini is said to be the most imitated magician in the world but his skill and showmanship could never be duplicated. He was one of the very few performers who could present an act using just cigarettes, playing cards, billiard balls (that multiplied and changed colour), and thimbles on some of the world’s largest stages. Normally these are the props used in close-up or parlour magic. His artistry went beyond the boundaries of conventional magic acts, where he incorporated acting and dramatization into his performance, honed and strictly choreographed and timed to coincide perfectly with the music. The legendary Cardini passed away on November 12th 1973 in Gardiner, New York at age 77. His legacy is left for all those who aspire to become sleight-of-hand performers. Never has there been such a superb manipulator of pure perfection in the history of magic.